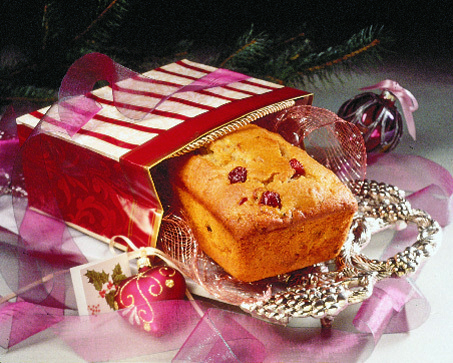 Maraschino cherries, bananas and macadamia nuts are a perfect trio in this holiday quick bread. Drain maraschino cherries. Coarsely chop cherries; set aside. Put butter, brown sugar, eggs and cherry juice in a large mixing bowl. Mix with an electric mixer on medium speed 3 to 4 minutes, or until well mixed. Combine flour, baking powder and salt; add to butter mixture alternately with mashed bananas, beginning and ending with flour mixture. Stir in cherries and nuts. Lightly spray a 9x5x3-inch baking pan with non-stick cooking spray. Spread batter evenly in pan. Bake in a preheated 350-degree oven 1 hour, or until golden brown and wooden pick inserted near center comes out clean. Remove from pan; let cool on wire rack. Wrap in plastic wrap or store in a tightly covered container.